This month will include online workshops via Zoom video conferencing. You can participate in some or all of the month's offerings in real time or via recordings. Times listed in EST. Convert to your time zone here. 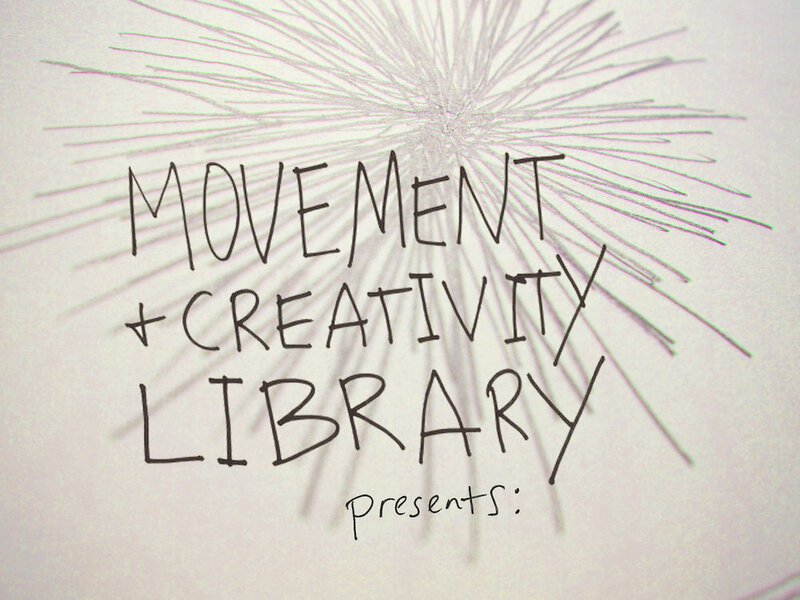 Move Your Vision includes a sampling of practices included in Movement & Creativity Library, a library/community of 150+ Feldenkrais Awareness Through Movement® lessons and guided practices to support nervous system regulation, reduce pain and awaken creativity. To begin our month together I will walk you through a mindful planning practice I have evolved over the years that helps me manage many to dos and bigger visions, influenced by teachings on productivity and creativity, particularly David Allen's Getting Things Done. I'll share some templates that you can customize to fit your life and a few video tutorials for how to use the templates. Inspired by Authentic Movement practice and Feldenkrais principles, Move Create Practice is designed to support deep creative process with the body as muse. 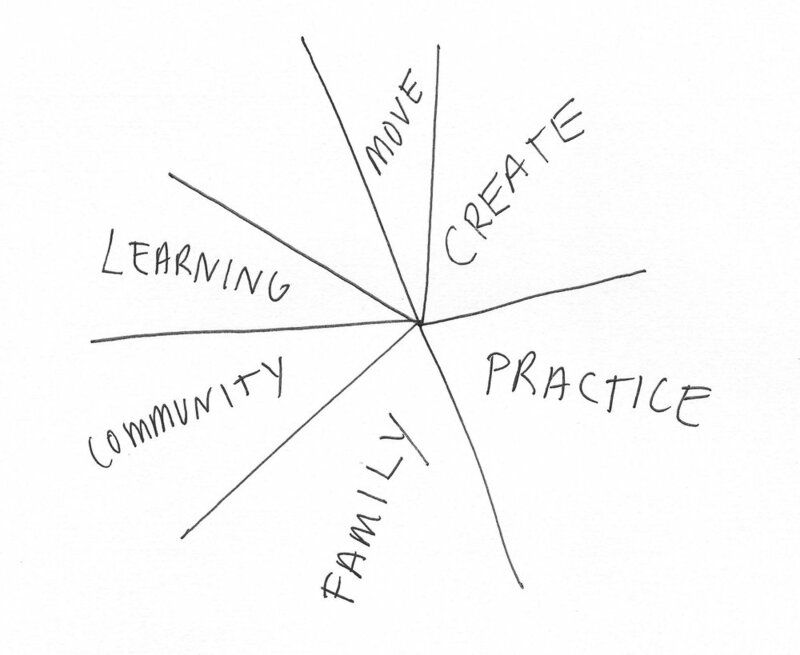 We will set aside the practical to-do-list stuff and create space to move your vision through embodied practice. The Feldenkrais Method is a process of embodied learning through movement and awareness that gives you access to your potential developed by Moshe Feldenkrais. You will receive a Feldenkrais audio download for you to keep exploring the movements of your eyes + you can explore more lessons during your free trial of Movement and Creativity Library. Organic Intelligence is the art of attuning to your nervous system’s naturally arising impulses that move you into your life path. You will receive an Organic Intelligence audio download to practice on your own when the time is right + you can learn and explore more in the library. Chronic pain and muscle tension, digestive upset, fatigue, anxiety or depression, difficulty healing, restlessness, trouble focusing or relationship imbalance- these are some of the most common signs your nervous system could be overloaded or running in different survival modes. This introduction will help you understand the process of regulating your nervous system. Participants will have the opportunity to share in guided explorations to tap the power of the vagus nerve, the primary neural pathway which helps us feel secure, connected with others and calm. Begin or progress your journey of inner harmony and growth by learning to recognize the circuits, modes and parts of your nervous system. This seminar will be especially helpful if you or someone close to you struggle with any of the above issues or if you are a health practitioner, parent or caregiver, as nervous systems develop and re-pattern with the support and influence of those who have cultivated loving presence and understanding. Mary Bacha sees and engages the kid in everyone. She specializes in nurturing adults and children to develop resilience from trauma, deepening and lengthening their lifespan. Mary is a Registered Somatic Movement Therapist certified in Feldenkrais (R) and Body-Mind Centering (R). She teaches around the world with established practices in Seattle, Portland and online. She is currently finishing her thesis on the vagal system to complete her education as an Osteopath from the Collège d'Études Ostéopathiques de Montréal. This is an opportunity to come together with other creators (of any kind) and shine a light on blocks and limiting beliefs that can hinder the full flower of your imagination and creative processes. Amy Walsh is a visual artist, and visual storytelling and branding educator for small businesses and organizations. She teaches people with projects - whether its a business, organization, or other body of work - to communicate the content of their work with imagination, creative skill and ethical marketing savvy. She’s also super geeked out about how to unleash the limitless imaginative and culture-making capacities in all of us. In this mini-workshop Steve Hoskinson will give you insights into the “joy-filled biohacks” of Flow. Often we think of these as opposites: creativity and planning, inspiration and perspiration, surrender and control, spontaneity and training, improvisation and practice. In this workshop, however, Steve will show you how they go together, and how Flow States are a special alchemy of intention that has both conscious and unconscious avenues. We will learn the gentle secrets for speaking the language of our creative genius, and how to attend kindly to our creative impulses— from inception to germination and then to creative expression. This workshop will help you be more productive, creative and happy! Steve Hoskinson, as a therapist, has trained therapists around the globe for nearly 20 years. His specialty is complex systems, and understanding how biology meets psychology. His teaching as Founder of Organic Intelligence® is now being made widely available to coaches, professionals and non-professionals alike. Since 1999, Steve has trained thousands of individuals in the helping professions in North America, Europe, Asia, and the Middle East in the art of the compassionate treatment of trauma. As a leader in the Somatic Psychology field, Steve worked as International Training Faculty for the Peter Levine’s Somatic Experiencing® Trauma Institute for 17 years and is currently Adjunct Faculty for JFK University’s Somatic Psychology program. "These recordings are so valuable. Literally life-saving and life-giving." "A vast and inviting playground..."
"Easy access to guided ATMs that are nicely paced and feel supportive of my process of discovery." "A slow, investigative, non judgmental, creative ground that nourishes my body and soul!"